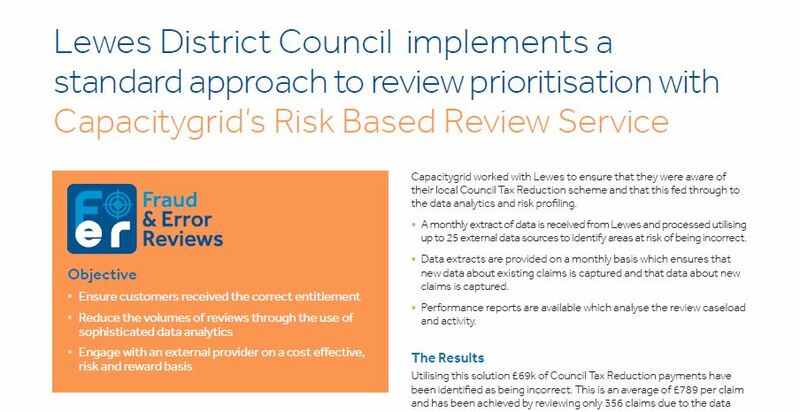 Our Fraud and Error Review is the UK's leading way to reduce fraud and error within your Housing Benefit and Council Tax Reduction caseload, with an average strike rate of 46% and savings of nearly £650 per CTR award. Our proven approach is already exceeding expectations, accessing up to 25 external data sources, combined with a sophisticated rules engine, it produces a single risk score which is used to focus activity where it is most likely to yield results. Typically selecting 10-15% of the identified caseload, we are able to substantially reduce workload and avoidable contact. This has already enabled 19 local authorities to correct nearly £4.5m of incorrect awards (£4.25m overpayments and £225k underpayments). Offered as a fully-managed service including the resources to work through these cases, Fraud and Error Review is also available through our Service Cloud platform which gives you the data sets, case management capability and suite of reports and outcomes to review cases within your existing team.